That's your wedding DJ's problem. Even if it's not his fault. Your DJ forgot to change the batteries in your officiant’s wireless microphone. It’s dead. No one can hear your wedding now. Your officiant turned her wireless microphone off after soundcheck. When your ceremony started, she forgot to turn it back on. No one can hear your wedding now. Your officiant’s wireless microphone worked great at soundcheck 30 minutes ago – and nothing has changed since. So why is the microphone behaving in a totally different unexpected way now that your wedding ceremony’s started? Could be radio interference, or gremlins, or the 200 guests with cell phones in their pockets that just showed up. We honestly can’t say for sure. This one’s a mystery. All we know is that – you guessed it! – no one can hear your wedding now. The first problem above is your DJ’s fault. The second one is NOT your DJ’s fault. The third one? Hard to say. But either way, you’ve got one problem now: Your guests can’t hear your wedding. 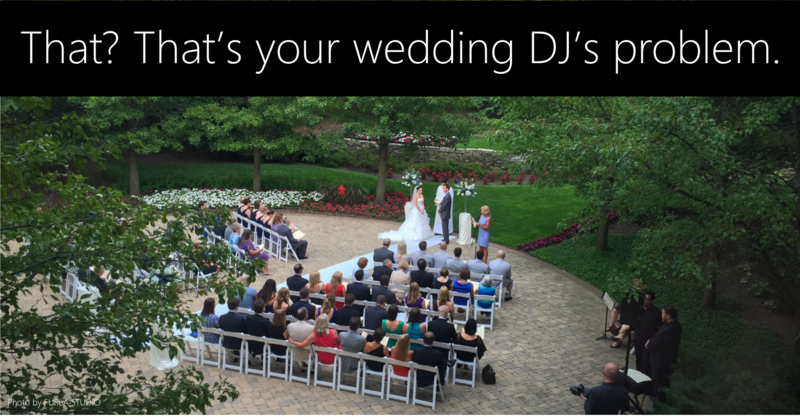 You’ve got one solution, too: Your wedding DJ. In the moment, no matter what the problem is, you need a DJ who can say “I got this” and walk up the aisle to hand your officiant a backup microphone. A microphone that actually DOES work. That can be awkward. It’s embarrassing for us to have your guests all looking at us, wondering why we had to give you that backup mic. The backup mic’s not quite as pretty; it has a long cable dangling out of it – but it is guaranteed to work. So at DJ training, that’s what we tell Backthird DJs they should do. No matter what caused the problem, it’s your DJ’s job to solve the problem. Make the wedding work. No matter whose fault it was - it’s your DJ's problem. That’s how we try to do things on your wedding day. We’re pros, but we’re not perfect – sometimes we do make mistakes. So do your other vendors. And sometimes, it’s no one’s fault and things just get a little goofy anyway. That’s life. And that’s weddings, too. Not YOUR wedding, of course. Yours will be perfect! Hiccup-free. But just in case it isn’t… when you hire your vendors, look for people who are focused on TAKING responsibility instead of AVOIDING it. Look for people who make it their problem, even if it’s not their fault. Get “I got this.” You’ll be glad you did.